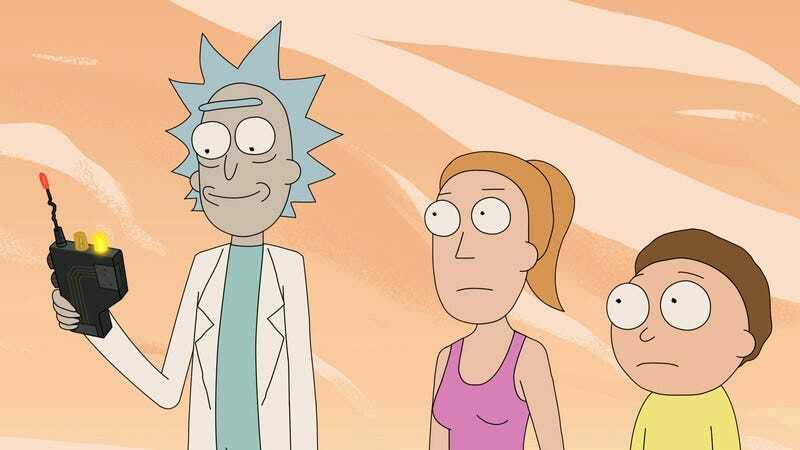 Over the course of its first two seasons, Rick And Morty has made a name for itself as a show where anything can and will happen. The writers have pushed the limits of the sci-fi genre by taking their characters to an amusement park in the bowels of a homeless drifter; a world within a world within a car battery; and a universe where people are chairs, chairs are people, phones are pizzas, and pizzas are phones. Once co-creators Justin Roiland and Dan Harmon establish the look and feel of these outlandish settings, it’s up to one poor schmuck to figure out what the hell they’re supposed to sound like. Ryan Elder has been working as the sole composer for Rick And Morty since before the show was on the air. Using disparate elements from all corners of music history, Elder is able to create original songs and soundscapes that hopefully feel as alien as the characters and settings they surround. Sometimes he’s lucky enough to stumble upon what works by pure happenstance, like when he used some placeholder music for the show’s opening credits, but everyone liked it so much that they stuck with it. And while the show’s innumerable possibilities can sometimes make his job difficult, it’s hard to feel bad for a guy who gets to work on one of the most fervently obsessed-over shows on television.